Cook onion in Country Crock® Spread in 12-inch nonstick skillet over medium heat, stirring occasionally, 5 minutes or until onion is tender. Add vegetables and turkey and cook, stirring occasionally, until vegetables are heated through, about 5 minutes. Stir in prepared Gravy and cranberries. 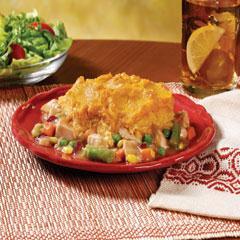 Evenly spread vegetable mixture into 8-inch baking dish, then top with mashed potatoes. Bake 15 minutes or until heated through. Serve, if desired, with additional Gravy.